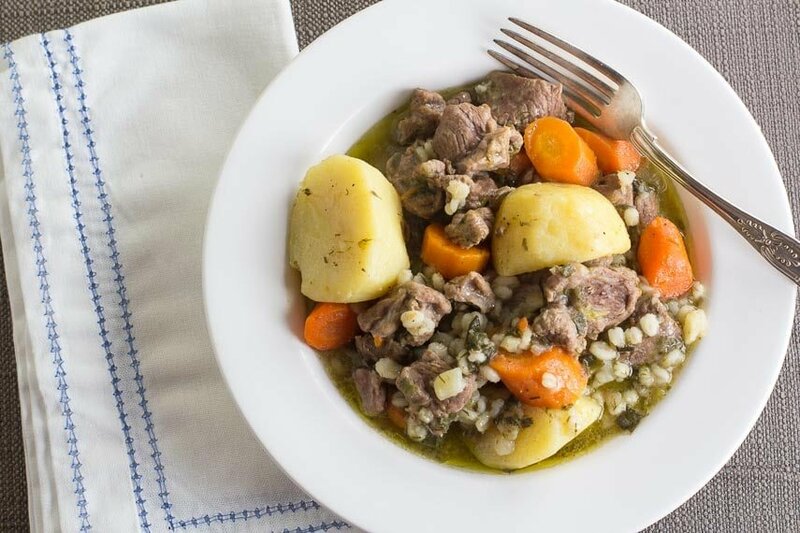 Low FODMAP Irish Lamb Stew – With Barley! I cannot tell you how excited I am about this Low FODMAP Irish Lamb Stew! It all came about when I wanted to make another main dish for you all for St. Patrick’s Day in addition to the awesome Low FODMAP Corned Beef and Cabbage. During my research I kept coming up with recipes for a warming, comfort-food stew featuring lamb and barley. Turns out that 1/8 cup (28 g) of cooked pearl barley is Green Light and Low FODMAP. Pearl barley more than triples in size when cooked. 1 cup of pearl barley will yield 3 to 3 ½ cups of cooked barley. This means that approximately 2 teaspoons of raw barley will be your raw low FODMAP amount. We have used 1/3 cup (66 g) raw pearl barley (just shy of 16 teaspoons) in our entire recipe here, which serves 9, so this serving size will yield a low FODMAP serving. Barley, by the way, contains fructans and GOS, so if you have passed your Challenges, feel free to have a larger serving. You will notice that I call for a russet potato as well as Yukon Gold style potatoes. The floury, starchy russet is chopped and added early and will break down and help create a rich base. The waxier Yukon Gold potatoes will be added later and retain their shape. This is a one pot meal that takes about 2 hours to cook, but that time is unattended while it is in the oven, where the low heat and a heavy Dutch-oven can work their magic. Once it is finished, dinner is ready! And it even tastes better on Day 2 and Day 3! And if you are in an Irish mood, check out our Irish Soda Bread (2 versions), Irish Whiskey Chocolate Mousse, Black Velvet Chocolate Guinness Cake and Irish Coffee. Also, read our article about the St. Patrick’s Day holiday in relation to the low FODMAP diet. We know you want to know about the green beer! 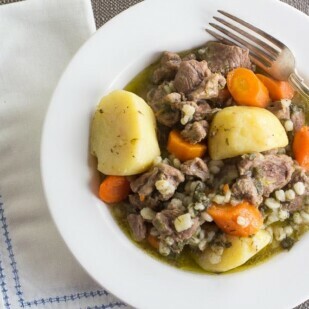 Our Low FODMAP Irish Lamb Stew features low FODMAP amounts of barley! Position rack in lower third of oven. Preheat oven to 325°F/165°C. Heat the butter and oil in a large Dutch oven over low-medium heat until the butter melts; add the leeks and scallions and sauté until softened but not browned. Add the lamb, thyme and Worcestershire sauce and stir well to combine with the leeks and scallions. Add the stock and the chopped russet potato, stirring everything together. Cover, bring to a boil, then place in oven. Cook for 1 hour. Season with some salt and pepper and stir in carrots, Yukon Gold potatoes and barley. Cover and cook for another 1 hour in oven. Taste and adjust seasoning with salt and pepper. Stew is ready to serve, or you may refrigerate it for up to 3 days in an airtight container. Reheat on stovetop.